How do you like your eggs at Easter? The Bar at 108 Marylebone Lane have opted for theirs scotched. Easter weekend is officially just a hop and skip away and as we all prepare to spoil our loved ones (and ourselves!) with scrumptious sweets and treats, we can’t help but be inspired by the rather ‘speggtacular’ showstoppers in shops and eateries up and down the country. The Bar at 108 Marylebone Lane’s quartet of Scotch Eggs have cracked it opting for savoury rather than sweet offering an exclusive Easter menu of Truffle Mac ‘n’ Cheese Scotch Egg, 108 Gin Cured Salmon Scotch Egg with Rye Crumb, Spiced Chickpea and Black Lentil Scotch Egg with Curry Mayo and a Classic Scotch Egg – just fabulous. 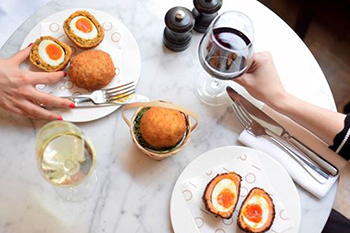 So Londoners, before you delve into all the chocolate this weekend, from Friday 19th – Sunday 21st April treat yourself to their Easter Scotch Eggs (all made with Clarence Court Eggs) dished up by Executive Chef Russell Ford. You’d be helping a good cause too with £1 from the sale of each Scotch Egg donated to the Marylebone Consortium; The Marylebone hotel’s initiative to fund worthwhile causes in the local area, through support for charities, organisations, schools, churches and residents associations.